Scrappage cash will go unused | What Car? 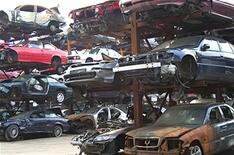 Scrappage scheme money will be wasted after payments to some manufacturers have been rejected by the Government. Whatcar.com reported last week that some manufacturers were submitting orders every three to four months, rather than every two weeks as demanded by the rules of the scheme. As a result, the Government is not able to adjust scrappage quotas and allocate the money to manufacturers. A spokesman for the Department of Business, Innovation and Skills (BIS), which runs the scheme, confirmed manufacturers have already been told that they will not get the money unless they can demonstrate extraordinary circumstances. The spokesman said it would also be impossible to say how much cash will go unspent until the scheme closes at the end of this month. If you've signed on the dotted line for a scrappage deal, you won't have to pay any more if the dealer/manufacturer paperwork isn't in order. The added cost of the deal will have to come out of their pocket.